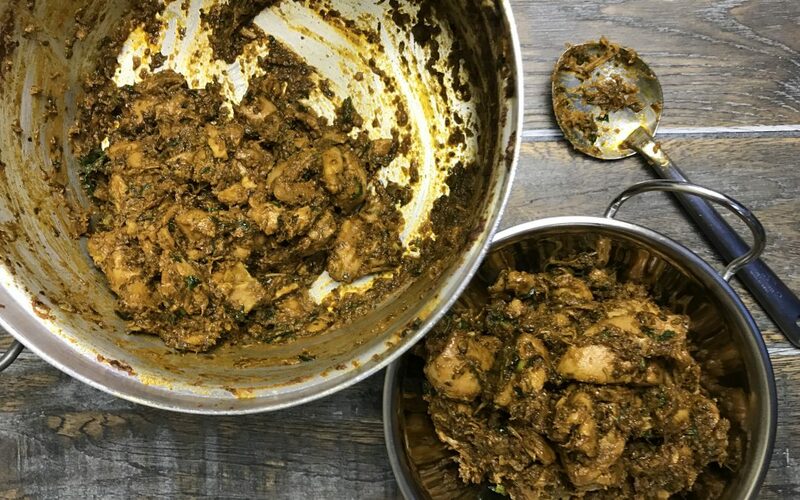 My methi murg ('fenugreek chicken') recipe is a family favourite. The thick masala coats and clings to the chicken and tastes delicious with fresh buttery naan or roti. Methi grew in abundance at grandma’s farmhouse, which is where I first tried this dish. Methi has a pungent aroma and a powerful flavour but getting the balance right in a dish will take it to a supreme level. In Punjabi cooking we use methi seeds, dried methi and fresh methi. The predominantly earthy flavour of fresh methi complements many dishes and I will start by sharing my favourite. 1Heat the oil in a large saucepan on a medium-high heat. Add the cumin seeds and when you smell the aroma of cumin add the onions followed by the salt. Cook the onions for 8-10 minutes until the onions are caramelised. 2Add the ginger, garlic and green chillies and cook for 2 minutes, stirring frequently. 3Add the coriander powder and turmeric, reduce the flame and stir for 1 minute. This is very important as ground spices can burn easily and turn bitter. 4Add the tomatoes and increase the heat back to medium-high. Cook the tomatoes for 4 minutes. The tomatoes will reduce and blend with the masala. 5Wash the methi leaves thoroughly and pulverise using a mini chopper. Add the methi leaves to the masala and cook for 3 minutes. 6Add the chicken thighs to the pan and coat them with the masala. Stir for 5 minutes, then cover the pan with a lid and cook for a further 5 minutes. Reduce the heat to medium and stir occasionally. 7Remove the lid and increase the heat to medium-high again. Cook the chicken for a further 7 minutes, stirring frequently. 8Once the chicken is cooked add the garam masala and fresh coriander and stir. Serve immediately with fresh roti and raita. Cilantro Chutney Chicken Recipe – A garlic and ginger rub sets the stage for a spicy, homemade cilantro chutney to serve over chicken baked in a divine cashew cream. I’m not sure- Soak the dried leaves in a little water to rehydrate them may help? Can you make this with dried methi leaves? Would the quantity be the same? this recipe doesn’t use a pressure cooker! Fasten the lid on the pressure cooker; cook until the chicken is tender, about 30 minutes.